Note: Due to a confluence of reasons, the Treehouse Bar/Cafe CLOSED in the spring of 2006. We may reopen in a different form in the future, and we would like to thank everyone that patronized our establishment. Located in the historic Shangri-La (a.k.a. 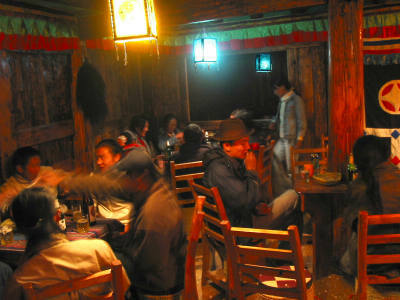 Zhongdian) old town, the Treehouse Café/Bar offers a pleasant and cozy place to sit, relax, and enjoy your time in Shangrila. "The laid-back Treehouse is an ideal place to sip tea and snack on sunflower seeds while warming your toes beside a wood fire." -- Time Magazine Global Advisor, May 9 2005.